With the increasing number of security violations and data theft, it is not easy to browse securely online nowadays. A report from internet Security Company Symantec shows that just in 2015 around half a billion data was either lost or stolen. That is why using a VPN is advisable. But again the point comes like there are hundreds of VPN provider companies and so which one to choose? I am personally using lots of tools and keep on experimenting with those. I have also written a mega list of best blogging tools where I have listed some tools from different areas. And so in this process, I came across a premium VPN service, Le VPN which seemed promising. Here is Le VPN Review where I will discuss a different aspect of Le VPN, its features, pricing and why you should use Le VPN. 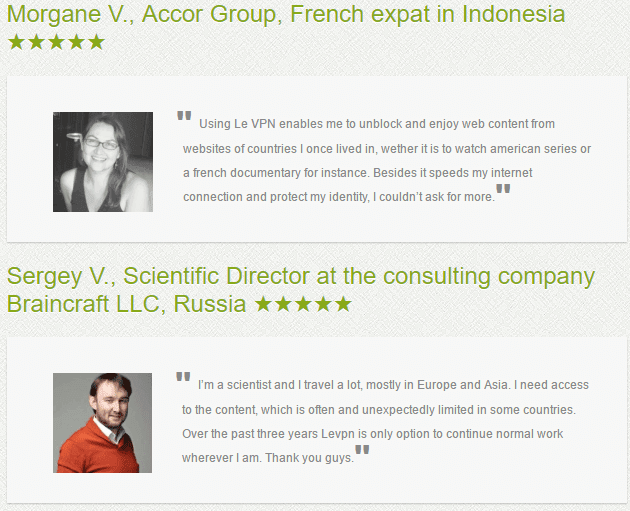 Le VPN Review -Le VPN at a glance! Le VPN is an online security and privacy service founded in France and now located in Hong Kong. It helps users to protect themselves from online thefts and threads, access geo-restricted services and unblock their favorite sites like Netflix and BBC etc. It is a premium and reliable VPN service which supports all the major platforms like Windows, Mac, Android, iPhone or Linux and is committed to providing the restriction fewer internet services to all the locations and devices easily. 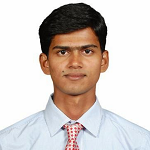 It has over 700 servers located across 114 countries providing wide options to the users. How committed Le VPN is towards their service reflects from their mission statement- “by using Le VPN any kind of restrictions can be bypassed for watching favorite programs and TV shows”. Le VPN provides wide ranges of features to their customers making it an ideal option when it comes to VPN. By subscribing to Le VPN’s one account you can protect multiple devices. For example, you can protect phone with PC or tablet with just one account. Le VPN allows 2 simultaneous connections on 2 different devices with different operating systems. This is another excellent feature by Le VPN where you will have benefits of a smart DNS service. It helps you to watch live TV from abroad with high speed and limitless streaming. Le VPN offers an extensive list of the most popular TV channels and streaming services in the US, UK, and France. The full list of TV channels available you can find on their SmartDNS page. HybridVPN is a unique service created and offered only by Le VPN. HybridVPN is a combination of their SmartDNS feature and of their VPN connection. Using HybridVPN means automatically unblocking a large list of TV channels in the US, UK and France with fast streaming speeds while keeping your Internet connection secure with VPN encryption. HybridVPN is available for all 114 countries in Le VPN servers’ network and is one of the best features of Le VPN service. Netflix made a lot of noise by blocking most of the VPN providers and denying access to their streaming services to all the users who connect with a VPN. The good news is that Le VPN is amongst the few VPN providers who are still able to unblock Netflix in the US, France, and other countries, with their VPN service as well as with their HybridVPN and SmartDNS. As I mentioned earlier, Le VPN has over 700 servers from different parts of the world. All these servers are spread in 110+ countries covering five continents. With Le VPN servers you can connect to any restricted sites at your location like social media sites, video streaming sites easily and without comprising the security. With such a huge number of servers, you can connect to any locations as per your desire and need. All the servers are highly reliable and capable of providing the high-speed and reliable network. Usually, it has been seen that after using VPN, speed decreases gradually but this is not the case with Le VPN. The presence of Le VPN’s servers all across the location helps them to provide high speeds. Above is the speed test done after using the Le VPN which clearly shows how reliable it is? Also, Le VPN provides a HybridVPN service which in combination with SmartDNS provides vibrant streaming solution. This is another great feature by the company where it works on “no logs policy”. That means whatever you will browse won’t get logged anywhere else. Usually, some VPN keeps logs for few days but that is not the case with Le VPN. Le VPN helps you through FAQs section, knowledge base, and ticketing system. Whenever you will face any issue, just check the knowledge base to see if there is any article related to your issue or not. If not, just raise a ticket for their support team and be sure to receive timely response and resolution. They have also recently introduced a live chat on their website, where you can ask them anything and get an instant response. 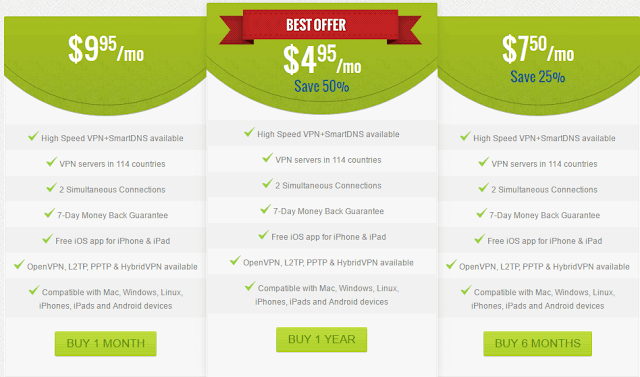 Le VPN is a complete premium VPN service and comes with three different pricing options. You can either select monthly or half-yearly or yearly pricing options. The monthly plan comes at $9.95/month followed by half-yearly at $7.50/month and yearly plan at $4.95/month. You can pay through almost all the payment modes like PayPal, credit cards (Master Card, Visa Card, American Express, Discover, UCB, and Diner Club), Bitcoin, Phone, Fax, Mail, Bank Transfer and Skrill. Le VPN also provides 7-days money back guarantee. You can ask for the refund within the first seven days of your purchase if you are not satisfied with any of their services and features. I have personally tried many VPN service and can say Le VPN is among the top. Their excellent speed, multi-logging feature and a large number of servers are something which makes them the ideal choice when it comes to VPN. The pricing options are also very ideal and monthly subscription just starts at $9.95. But I would suggest you to go through the yearly plan as it will save around 50% of your money. For more details about Le VPN, you can check this article. Which VPN you are using?